Mortality is now almost exclusively a feature of old age, with deaths below age 40 massively reduced. The most common age at death (the modal age) has increased, as has the average age at death. 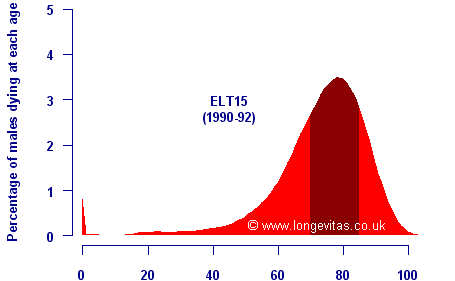 The distribution of age at death is much more symmetric, with the tail to the left at younger ages much less pronounced as premature deaths are reduced. 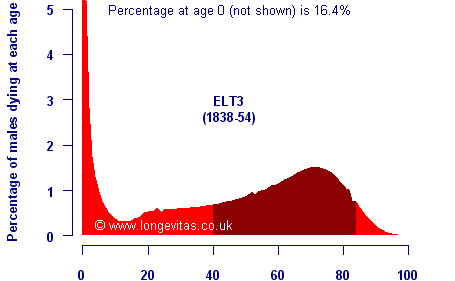 The age range with half of all deaths has also shrunk, a phenomenon known as mortality compression. The peak age at death is likely to increase. Mortality compression is likely to continue, shrinking the age range with half of all the deaths. The distribution is likely to become more symmetric, with fewer premature early deaths. This offers two techniques to apply to projecting future improvements. The first is that the features above can be used to check the "sensibleness" of a given projection basis. Alternatively, the three features above can be projected themselves, and mortality improvements derived from the tables implied by the curve of deaths.